This week a very special thing happened – the two kitchens became one! We planned a lovely citrus themed menu for the occasion. I ate 6 or 7 croissants (seriously… I think I need an intervention) and did some Christmas shopping in the pouring rain the morning before Amy arrived in New York. What could I make for such a festive gathering? 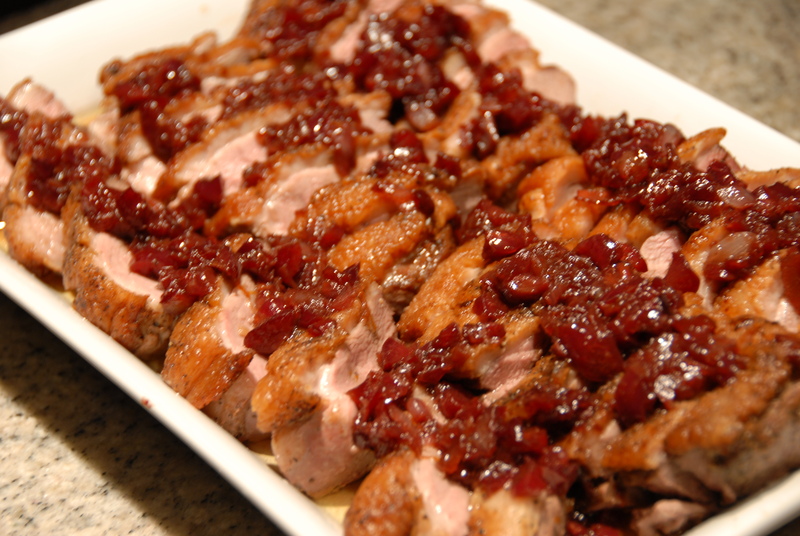 I finally decided to make duck breasts with a citrus/port/cherry sauce. According to her text messages, Amy had selected a grapefruit salad (very out of character if you ask me…suspicious). The recipe I chose is yet another fantastic Claire Robinson dish. 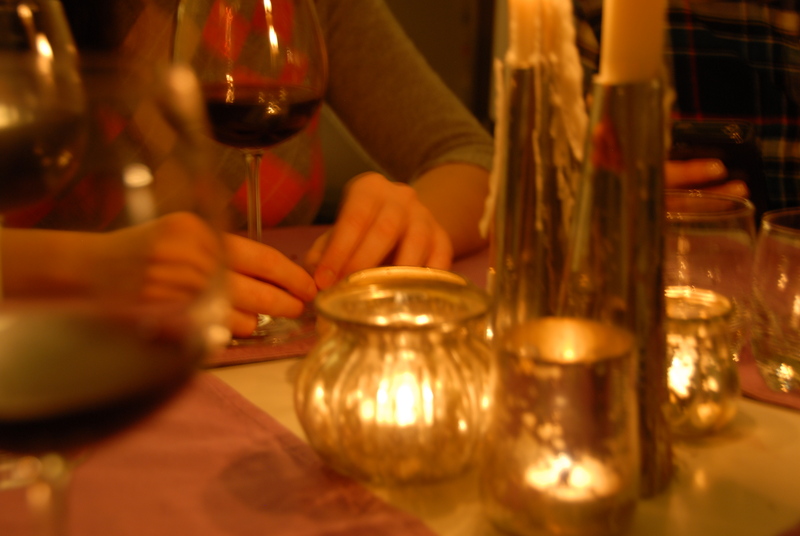 I started to prepare at about 5:30PM in anticipation of a 6:00PM dinner. I put the minced shallots in a small bowl, the port and orange juice in another, and the cherries (I actually used fresh cherries and pitted them myself) and zest in a third. Score each boneless duck breast (the recipe calls for 4 but I used 5) in a crosshatch pattern, making sure to not cut all the way through the fat. Season both sides with salt and pepper. Place the breasts (skin side down) in a nonstick pan over medium-high heat for 10 minutes, flip over and sear the other sides for about three minutes. Transfer the seared duck breasts in a baking dish (skin side up) in a 400° F oven for 12 minutes, then allow them to rest under aluminum foil until ready to slice. Meanwhile, pour off most of the excess duck fat from the pan (by all means save it for making various duck fat delicacies!!) and add the shallots. Sauté them until they are translucent and then add the port/orange juice, scraping any delicious bits from the bottom of the pan. 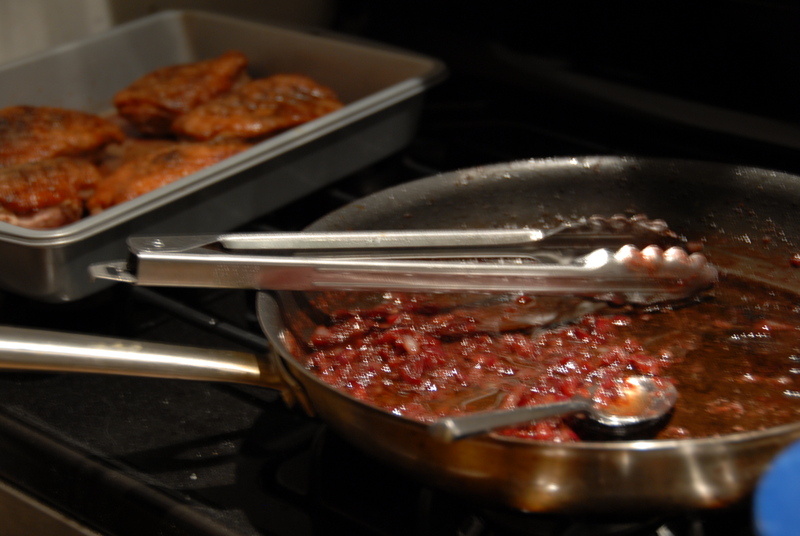 Finally add the orange zest and cherries – simmer for about five minutes to reduce the mixture. 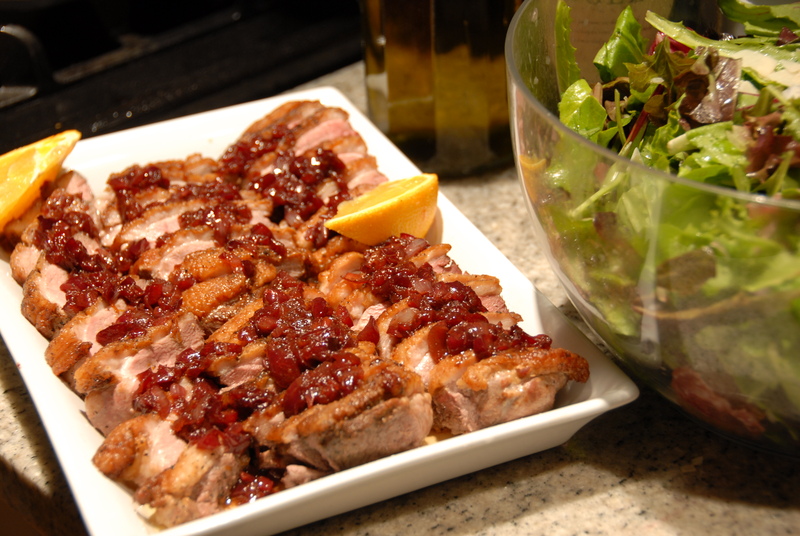 Slice the duck breasts into ¼ inch slices on a diagonal, pour the sauce over top and serve. Hey! It’s a long haul from Ohio! I had people to see, a salad to shop for, and trying to catch a cab in the rain is next to impossible. The ladies should be glad I at least brought enough wine to compensate for my tardiness. So I’m in Whole Foods, picking up greens, grapefruits, whatnot and I thought, this salad is simply not complete. But what would complement the delicate tartness of grapefruit and a fresh vinaigrette….? I think you know the answer… cured meat. And some parmesan for good measure. Ahhem. I don’t think anyone was complaining when I mentioned the addition of sweet sopressata, but I digress, there was a salad that needed to be made. Place greens of your choosing and grapefruit segments in a salad bowl. 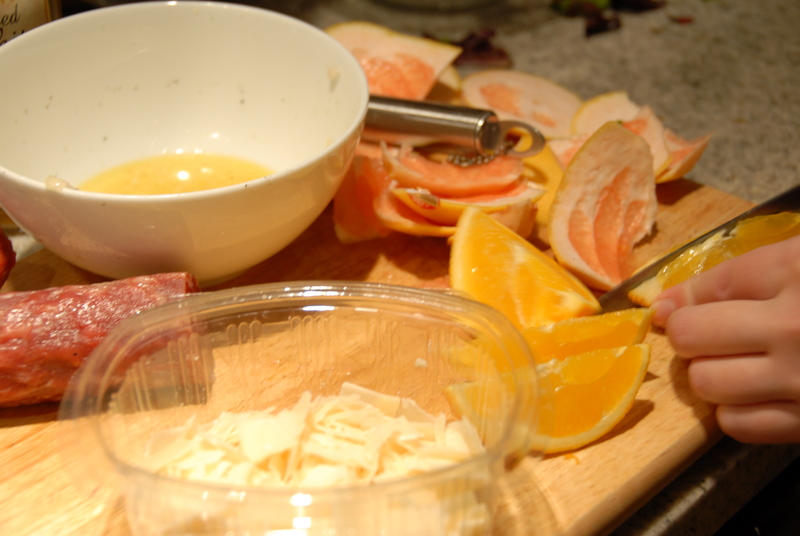 Segment the grapefruit by first pealing off the skin and pith then cut away each segment with a sharp pairing knife, placing the fruit in the bowl and squeezing the juices in a separate bowl to use for the dressing. My original hope was to put fresh tarragon in the vinaigrette but somehow it went missing from the time I got in a cab in Union Square to the time I reached Hillary’s doorstep. Raiding the pantry we found rosemary oil which turned out to pair with the grapefruit really well. Along with the grapefruit juice add the minced shallots, salt, pepper, rosemary oil, vinegar and olive oil, wisk and it’s ready to go. I sliced the sopressata thin and tossed it in with a healthy handful of parm. Fresh, salty, a great side to the duck. Here’s a quick run down of the ingredients. I’ll admit the salad was delicious… we ended the night on a sweeter note however. There is an amazing restaurant in Captiva, FL called the Bubble Room, which makes THE best cake in the world. My personal favorite is their orange crunch cake. It is quite simple to whip together (Mr. William Li knows this as “The 96th Street Mosque Cake”). Buy any kind of yellow cake mix, add the amount of eggs and oil it calls for, and then use half water, half freshly squeezed orange juice instead of just water. Also throw the zest of one orange into the mix. Next comes the crunch layer. Crush 1 cup of graham crackers (I actually used teddy grahams which was borderline disturbing… taking a meat tenderizer to their charming faces was difficult), add ½ cup of brown sugar, ½ cup of sliced almonds (or any other nut you prefer), and ½ cup melted butter. Grease and flour two 9” round cake pans, press half of the crunch layer into the bottom of each, and then divide the batter evenly among them. Once the cakes have cooled, stack them so that there is one large crunch layer in the center (the top of cake #1 should be at the very bottom of the stack, and the top of cake #2 should be at the very top) frost, and enjoy. And thus concluded our evening of old friends, new memories, and citrus. 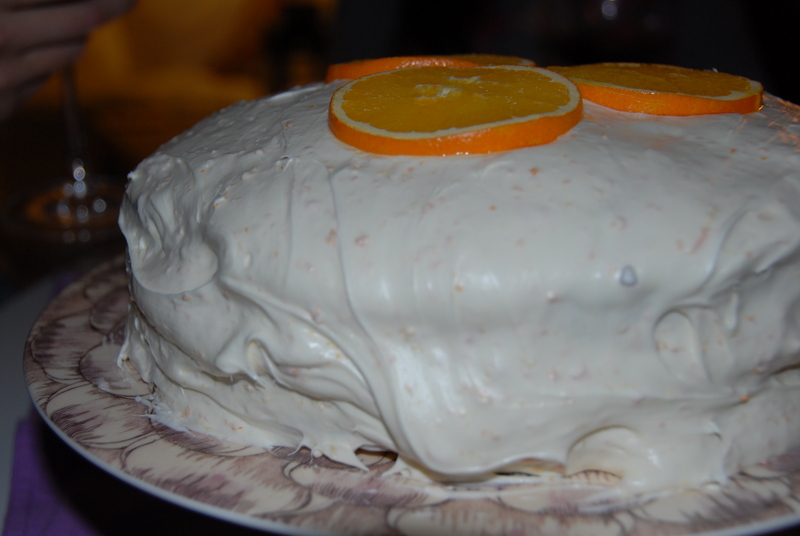 This entry was posted in Citrus and tagged cherries, Claire Robinson, duck, grapefruit, orange, orange crunch cake, port, sopressatta, The Bubble Room. Bookmark the permalink. 2 Responses to Orange You Glad We’re Friends? i love this post! so clever and cute to include your banter.